That person, who did not unite his essence, that is, body with the Noori Essence of Allah Almighty, that is, he did not achieve Baqaa after experiencing Fanaa in it, such person cannot be called a Truthful Aashiq but instead he is called a liar. 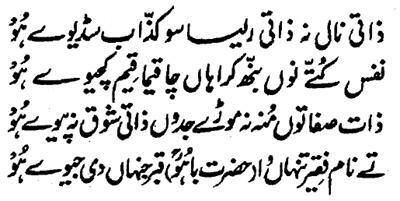 Hence, the Seeker should make the mince of his Nafs-e-Ammara after killing it. Moreover, the Seeker can never turn his face away of his calibers and sensuality unless he has drunk the goblet of the Fervor for the Essence. That is, till the time he has not become Mast with the wine of the Essence, the Seeker cannot give up the physical tastes and interests. 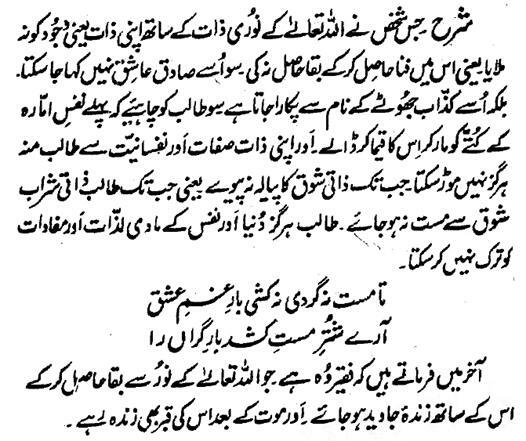 At the end, he says that 'he is Faqeer, who becomes living forever after attaining Baqaa from the Noor of Allah Almighty and his grave is living after his death.